Here is all you need to know on how to make yogurt quickly and inexpensively without a yogurt maker. The health benefits of yogurt can be inexpensively enjoyed from your own kitchen. I must credit my friend Lydia for teaching me how to make yogurt without a yogurt maker. The following yogurt recipes and tips are a combination of what I learned from Lydia and my own yogurt experimenting. A warm insulted container such as an ice chest or an oven set at 100° F.
On top of the stove, bring the milk to about 115° F. Remove the milk from the stove. Immediately whisk in the commercial yogurt. Pour into containers and cover with a plastic wrap. Place the containers in the cooler or oven and leave them undisturbed for 6 to 10 hours. Remove the yogurt and chill in the refrigerator. When it’s cold, enjoy the yogurt! How to Make Yogurt ...Even Better! Yogurt making is NOT a perfect science. Occasionally, for reasons unknown, you may have a batch that will not set. It happens to all of us, so don’t be discouraged with the occasional failed batch. Choose your commercial starter yogurt carefully. Find a brand with as many bacteria strains as possible. The more “bugs” the better. Making yogurt with only one or two live active cultures will result in a sharper tasting yogurt. The high nutritional properties of yogurt are in the friendly bacteria, so choose the brand with the most. 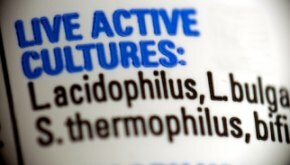 My personal favorite brand of commercial yogurt that I use as a starter has six “live and active” yogurt cultures. Make sure that ALL of your utensils and containers are spotlessly clean. Bacteria hiding in any crevice can interfere with the yogurt-growing bacteria and ruin your batch. Do not add the yogurt starter to the warm milk if the milk is hotter than 115° F. Over this temperature, the heat will kill the bacteria and the yogurt will not set. Once you have the yogurt poured in the containers and in the warm place, DO NOT move or disturb the containers in any way. If you are using the cooler method, it is best to make the yogurt in the evening and let it set undisturbed overnight. Experiment with different types of milk. Use anything from powdered milk to heavy whipping cream, from soy to rice milk. If possible, use raw unpasteurized milk to get the most nutritionally rich yogurt. Remember to save a bit of the homemade yogurt for your next batch of yogurt. You can continue to use the culture from the preceding batch until you start to see the quality of the yogurt decreasing, then it’s time to use commercial yogurt again. Once you remove yogurt from the incubator, store it in the refrigerator. It may not appear to be totally set until after it’s cold. Homemade yogurt will not be as solid as the store-bought type. This is because you are not adding any thickeners. Serve plain homemade yogurt topped with natural maple or chocolate syrup. Do not try to add fruit or fruit preserves when making yogurt. Add fruit only after the yogurt has cooled. Add 2 ½ to 3 tablespoons of honey, sugar or maple syrup to the yogurt-infused milk before pouring it into the containers. Stir to dissolve. Chocolate yogurt- Try using your favorite chocolate milk or try any other flavored milk such as vanilla, banana or strawberry. Vanilla yogurt- Add ½ teaspoon of vanilla extract and 2 ½ tablespoons of sugar to the yogurt-infused milk. Stir to dissolve the sugar completely. Coffee yogurt- Add 1 tablespoon and 2 teaspoons of instant coffee granules, plus 4 tablespoons of sugar to the yogurt-infused milk. Stir to dissolve the coffee and sugar. Yogurt has all of the nutrients found in milk such as calcium, phosphorus, Vitamins B2 and B12 and protein and minerals, such as potassium and magnesium. Added to all these milk nutrients are the live, friendly bacteria that changes milk into yogurt. This friendly bacteria elevates yogurt far above milk. According to WebMD, the bacteria found in yogurt has several health benefits. The “live and active” bacterial strains are what your body needs to enhance healthy digestion. The friendly bacteria enhance the immune response, therefore boosting the immune system. The bacteria may also prevent yeast infections in women. If you want to bypass off of the yogurt but still get the wellness benefits of friendly bacteria, try an excellent probiotic supplement. Enjoy your yogurt for your good health and delicious eating!